"welding tests make me nervous!.. " Q: What is the best way to prepare for the 6g pipe test? "I shake when I test!.. " Jeff, First off, make sure you have the details of the test. You should call the test supervisor if at all possible and just tell ask him the details. For example: schedule 80 pipe with 6010 root and 7018 fill passes. ...or 8 inch schedule 40 pipe with tig root and hot pass and 7018 filler passes. There are about fifty different possible combinations. Welding something for the first time ever is hard. There is A huge difference in having done something once or not at all. Also, call a local welding tech school and ask if you can arrange some practice time once you find out what to practice. If it is a good job that pays well, it will be worth whatever you spend if it helps you pass. "one little arc strike sent you packing!.. " Ben,Dont be afraid to pick up the phone and talk to the test supervisor. 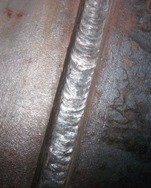 there are many different welding codes and some jobs give there own version test. that said.. it is likely to be a 3/8" thick plate with 1/4" gap and 1/4" thick backing strap. Q: I have a job interview/weld test coming up. its tig welding 3" sch 80 pipe @45 with top and side plates at 12"
they said i can use a mirror to weld the back side. i have made thousands of tig welds in virtually every position and on every type of material, but never welded with a mirror. any advice? What kind of sadistic Bastards are you going to be working for?Just Kidding!My best advise for using a mirror is to extend the electrode only far enough so that when you prop the cup , the electrode tip is the right distance to the weld. that will let you find a reference point. For example, for a root pass, you can get the electrode just right so that you can wiggle or walk the up in the bevel and the tip of the electrode is exactly on the root pass. Another thing is that everything is bassackwards in a mirror. So practice welding in a mirror before the test. even if you dont have the right scrap pipe , practice welding in a mirror on something. I understand the 6G position but what is the 6GR? 6GR means 6G "restricted". It is more difficult than a 6G.A steel plate ring is placed around the pipe about an inch below the weld. That restricts your access and your line of sight. It is intended to simulate when pipe ties into a bulk head and access is hindered. Hello Sir, I have a few questions for ya. I've been wanting to weld for a while but its been hard working full time and then try to find a class that actually certifies in welding. I can take the class but they dont get certification. Can i go somewhere a take a test and give it to me if i have the class hours? I was looking into underwater welding too, I was wondering if you had any exp. in that I know its good money but worth it? One more question, what would be the best kind of welding i should go into that is in high demand and pays good? Thanks for the info i really appreciate it. First off, If you can afford it, Hobart in Troy, Ohio has a 2 weekprogram for TIG welding with no prerequisite. They are also an AWS accredited test facility so when you finish the course you should be able to request a certification test for an additional fee. "AWS National Welder CertificationThe Hobart Institute of Welding Technology has been accredited by the American Welding Society to perform Qualification of Welders (AWS QC-7) since 1989. Contact the Hobart Institute of Welding Technology and ask for a copy of the Standard AWS QC-7-93 and Supplement G.
Decide which welding test you would like to perform, since we have many procedures already established for GMAW, GTAW, and FCAW - on both plate and pipe. Schedule a Test Date with the Certification Lab. 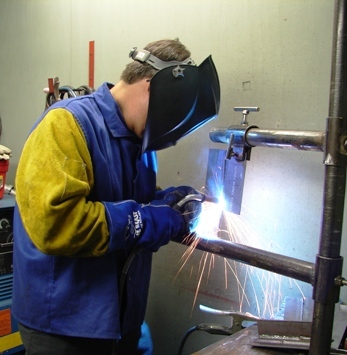 To determine the ability of welders to deposit sound welds in accordance with the standardized requirements. To impose sufficient controls on the documentation and maintenance of certification to allow transfer between employers without requalification, where allowed by standard or contract document. For prices and to learn more about becoming an AWS QC-7 CertifiedWelder, contact the Hobart Institute of Welding Technology at (800)332-9448 extension 5107 or 5609. " 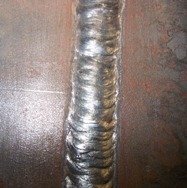 hi, I'm doing a 6g pipe welding test and i was wondering if you had any fine pointers as far as doing the root pass? 1/8" gap, 1/8" land. 4 tacks about 1 inch long each. feather the tacks on both ends with a grinder. That leaves 4 unwelded segments. When you are starting each segment, kind of long arc on the middle of the tack and move towards the feathered area as you close your arc length. By the time you reach the feathered area your arc should be close and when you reach the end of the tack it should start to keyhole if the amperage is right. (85-90 usually) . Pretend the keyhole is the head of a little nail and you are tapping on it with a hammer. forward and back, keyholing about once a second, thousand one...thousand...two..... weld right into the next feathered tack keyholing into it until the keyhole closes and continue for around 1/2" after the hole closes. Its hard to explain without showing but i hope this makes sense. Oh and I hope you were talking about a 6010 root pass after all that rambling. but halfway through I realized the flux coating on the 1/8 rod was too much for a exact weld, so I switched to a thinner 7018 rod with less flux, after that it ran like a dream with no angles like I had previously done. I'm trying to make it a habit to learn how to work the way things are done in the field. Also, do many welding shops ask that you weld overhead fillet on stick or can FCAW or MIG be used? mostly they were ok, just trying to do their job. If by hook or crook , you could talk to the guy who is giving the tests, I would bet he would give you the details. I once took a test on 2 inch schedule 120 pipe with a consumable insert root pass. No need to go into that but the point is, I had never done that before and I took the test cold turkey. I failed and had to go practice and then I passed. Had I known a little more, I would have known I could have remelted the part of the insert that didnt fuse. But there is a huge difference in having done something even once and not having done it at all.Is there any way you can get in touch with the test guy? That is your best bet. By the way, I prefer using the 3/32 7018 for root passes as well.As for your other question about fcaw and mig, The test is usually the test. period. They usually establish their basic needs and will have you test on other processes only if they need you qualified on those as well. That brings me to another suggestion: get as many certs as you can from each company you work for. I didnt do it on purpose but wound up with whole bunch of certs. I have squeezed a lot of mileage out of it. and have done various repair welding working offshore and for favors using my buzzbox and 10 yr. old can of 6011s. I'm ready for a career change and want to get back to welding. Most of the jobs I'm looking at require testing laying the root with a 6010 and the cap with a 7018. I have no idea what to expect as far as how it will be set up and what they're looking for. What tips/advice do you have? Every job is different but you can expect something like a 6g position schedule 80 8" pipe. Let me translate....6g means the pipe is on a 45 deg angle. The bevel will be somewhere between 30 and 37.5 degrees. The gap is usually 1/8" plus or minus 1/32". There is usually a land or flat spot on the sharp edge of the bevel of around 1/8". Again it all depends on the job and what their code requirements are. For example pipeline welding tests are usually done downhill. That's pipeline as in Alaska pipeline. But structural work and pressure vessel piping is almost always down uphill. Pipeliners are a different breed and I would guess most of the jobs you are checking out are just plain pipe welding jobs that are all done uphill. I always used a 1/8 gap with a 1/8 land if the bevel was 37.5 degrees (standard). You will space it using a 1/8 welding rod with the flux beat off. Get the fit up right by using the straight edge of a clear lens on the inside to align it. Put one tack about 1 inch long and then pull your spacer rod out. Otherwise you will play hell getting it out after 4 tacks. The gap will be off a little but with only one tack on it, you can tweak it a bit to get it back. Then put another inch tack 180 degrees from the first tack. Adjust the gap again and make the other 2 tacks. The tacks and the root are run the same way, around 85 amps. Keep the rod in tight and pretend you are hammering a tack in with a hammer. You move the rod slightly forward and then back into the puddle, again like it was a small nail you were tapping in with a small hammer. If you do it right, the root will look like it was welded from the inside. Your advice is great and makes good sense. Now let me be sure I understand. First off, the pipe will be set at a 45 deg. slant in relationship to the floor or the workbench they set me up at, right? That being the case, do they let me rotate the pipe or do I have to move around it as I fit and weld it? 45 degrees to the floor. Fixed position, they will not let you roll it. Most tests I have done were the 45 degree. but some were 5g which is where you are welding uphill from bottom to top and the pipe runs parallel to the floor. You should make a call or email the company and see if they will give you details. Once you know, you can email me and i might be able to give better advice. If I lay a 1" tack every 90 degrees, seems like there's not much left to complete the root pass. Do I just connect the tacks or do I lay a different, continuous bead? Any special tips for when I pass over a tack and then hit the gap again? well if its a 8" pipe, thats roughly 24 inches of weld. 20 inches even after the tacks. I was just guessing at the 8 inch pipe. your test might be bigger or smaller. each tack should be tapered on both ends with a grinder so that things tie in well. I also assume that welding uphill you mean start at the bottom and work my rod up from floor to ceiling, right? When making my tacks, how do I keep from keyholing, since it seems like a big gap to be filling. yep start at bottom and work to top. with a 1/8 gap and 1/8 flat land on the sharp part of the bevel, it will keyhole but thats a good thing, the trick is to just barely keyhole and move the rod forward and back to control the heat. Should I start my tacks at the top where it's more of a horizontal type of weld? if your amperage is right the two halves will joint together pretty quickly. whether you start at top or not. Reader For the fill pass with the 7018, how should I manipulate the rod to be sure it goes edge to edge? Start at the bottom and work to the top, then start again on the other side, tying in to the beginning of the first cap bead? if they allow it , i would make the second pass with the 6010. Then get out the 7018s. If the test is the 45 degree 6g, you will be running stringer beads. the first one probably should tie both the walls in.After that you will be stacking beads from the bottom up. Plan one bead ahead so you dont leave a deep groove that you cant penetrate.